Makers of luxury cars, including Aston Martin, Bentley, Rolls-Royce, could benefit from a ‘circular economy’ and thereby engaging in more closed-loop recycling, adopting a ‘rent instead of sell’ business model, and by lengthening product usability. The luxury automotive industry is seen as a prime target for this. It is a mature industry that has traditionally focused on high quality design and manufacturing, as well as prestige marketing. Its above-average Cost of Sales component (on average, 80 per cent of revenue) indicates lucrative cost-saving opportunities. Net profit margins in this century-old industry have also been gradually compressed, and currently average less than 7 per cent. 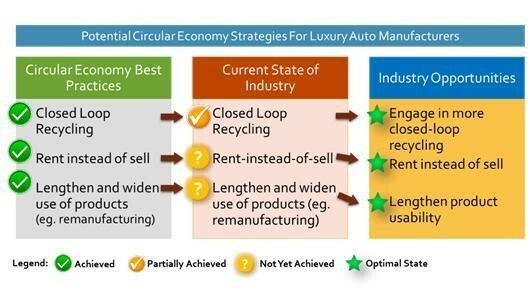 The Judge Business School at the University of Cambridge, using research conducted by Jonathan Xu of Harvard University, argues that by exploring circular economy strategies luxury auto makers can improve their profit margins. Although such programmes do exist today (eg. BMW’s), the onus is usually on the customer to contact and locate the collection centre, thereby creating customer inconvenience. Ideally, firms should establish greater incentives for customers to return their end-of-life vehicles to them directly so that materials eligible for closed-loop recycling can be directly extracted and re-manufactured into new vehicle components. Cars are among the most recyclable products with retired vehicles accounting for 95 per cent, paper 72 per cent, steel cans 67 per cent, aluminium cans 50 per cent and glass 33 per cent. Jaguar, for example, takes pride in using recycled aluminium for its latest aluminium-bodied vehicles. This type of recycling reduces energy use by as much as 75 per cent, according to the World Economic Forum. This translates into cost savings in manufacturing processes. It also ensures that automakers do not lose track of most of these vehicles after the initial sale, and can capture the full potential value of these vehicles since their average useful life is 13 years. This means that the business charges customers a fee to use their products and services. In return, customers enjoy greater peace of mind and convenience, while businesses reap higher profit margins. Netflix and Apple Music have already implemented this model in the movies and music industries respectively. If implemented in the auto industry, such an arrangement significantly reduces unnecessary consumer waste, and promotes vehicle longevity. In this model, manufacturers can mitigate reduced product turnover with increased customer loyalty and higher profit margins. This revenue model increases per-unit profits while reducing the need to continually increase manufacturing and sales force headcount. Luxury automakers could offer a Long-term Lease programme, in which the firm charges customers a monthly fee for driving the vehicle. Instead of actually selling the vehicle outright, the automaker retains ownership of it, and provides it with a lifetime warranty. During the vehicle’s lifetime (e.g. 13 years), the automaker covers all warranty-eligible repairs at no extra charge. In exchange the customer pays a fixed monthly fee for the entire duration. Manufacturers could also implement greater product recycling, refurbishment, and replacement programmes which engage with customers directly. By increasing the points of customer contact, firms have more opportunities to improve customer engagement, brand loyalty, and the profit margins. For example, currently there is a high degree of waste in the economy as US drivers only keep a new car for six years despite its average lifespan being 13 years. Research shows that four of the six main reasons for not buying a used luxury car have to do with lack of manufacturer support. For example, there is little or no warranty support; there is a likelihood of more maintenance being required; and they tend to use ‘old’ technology as a result of which repairs are more expensive. product usability after a ‘rent instead of sell’ model has been implemented will serve to improve firm profitability even further – as vehicle repair expenses decrease in the face of constant recurring revenue streams paid by customers.